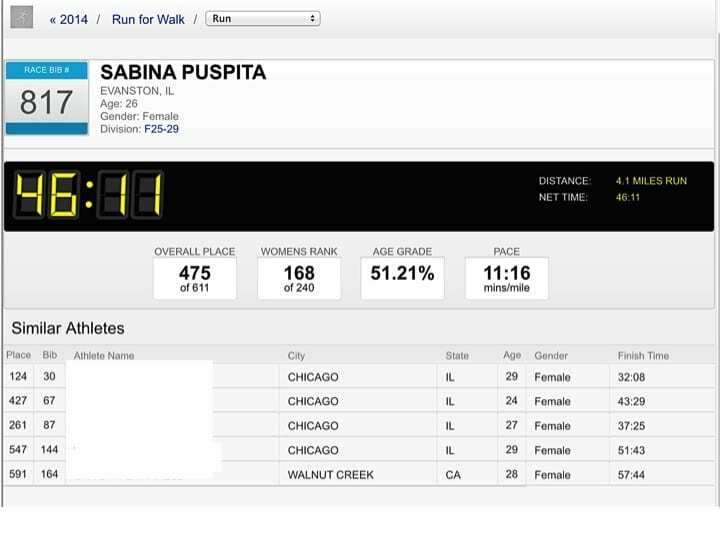 On Sunday, July 27, I joined the 3rd Run For Walk Race organized by Northwestern University (NU). The race was a 4.1mile (approximately 6.6kilometers) run starting from Ryan Field or NU’s grand football stadium, then along the campus’ lake and Sports Pavilion and Aquatics Center (SPAC), and back again to Ryan Field. The race is held annually from 2012 to commemorate one of the university’s best football coaches. Head Coach Randy Walker contributed many victories for the Wildcats (pride and mascot of NU) and died of a heart attack at a young age in 2006. The figure “4.1” is taken from Coach Walker’s jersey during his collegiate football years in Miami University. One of the reasons I joined this mini marathon was because an NU t-shirt and a ticket to NU’s football game giveaways were promised for a $25 registration. However, experiencing completely new athletic participation and keeping my body in shape were my two main motivations. I am glad I actually made the decision to register for Run For Walk. I managed to persuade my colleague Yoes to join as well. Both of us admire the passion Americans have for sports. More than 600 people—and about 10 dogs—were present at the 7.30 am race. People in their senior years were even more enthusiastic than the youngsters to run and walk until the end of the race. It was also interesting to see adorable children joining the run and bringing their pet dogs along. Another big excitement for me was also being finally able to see an American College Football Stadium (just like in the movies). On the walls of Ryan Field surrounding the spectators’ sitting area, I saw the years of NU’s victories in Big Ten conference championships. In the middle was a large press office box that looked very sophisticated. Americans not only take academic issues but also collegiate sports very seriously. From this healthy and fun experience, I also learned about a sophisticated technology called “B-Chip” timing system. A chip was attached to the back of my bib and so after finishing the race, I was able to know the exact pace of my run and my rank among the total number participants. In short, what seemed to be simply a fun race just to keep myself fit and socialize with new friends in the beginning, felt like a serious race at the end of the day. The organizers had done a great job in motivating people like myself to continue doing sports on a regular basis to up my game next time. I highly recommend anyone coming to NU to join next year’s Run For Walk race. Even without actually winning 1st place, the rewards of the race are still fulfilling. 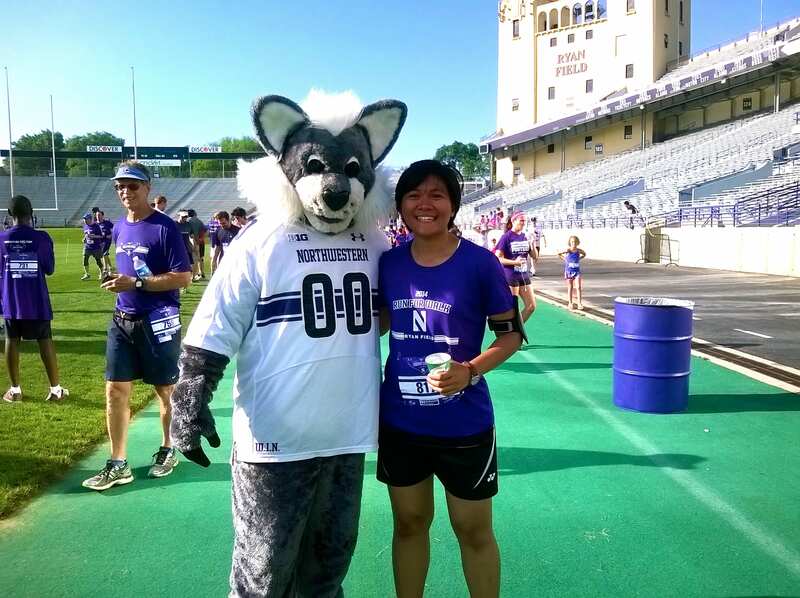 Posing with NU’s mascot, Wildcat Wille at the Finish line in Ryan Field. The B-Chip timing system enables me to search my results online.